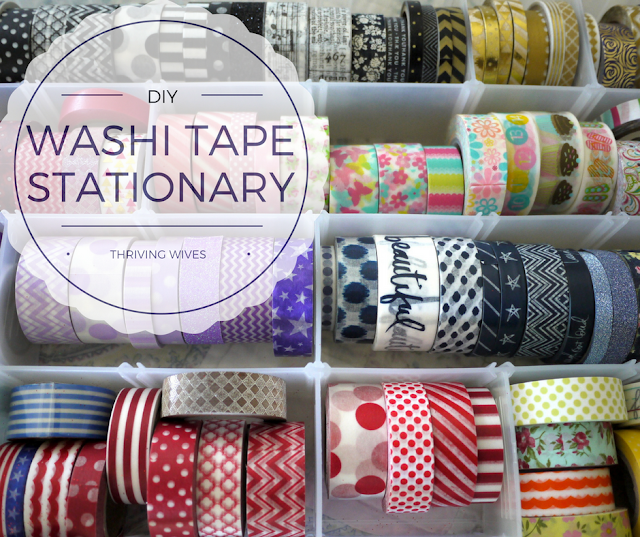 My latest obsession is Washi Tape. I literally use it on everything and cannot seem to get enough of it. As is typical of my super thoughtful MIL, one mention of this new love to her and BAM...huge collection of Washi Tape delivered right into my hands...Best. Gift. Ever. While I usually would run to Target to buy cards for every occasion, with my new wonderful Washi selection, I decided buying cards was no longer for me...I would make them myself! When whipping up your own stationary, I suggest using cardstock as it is thick and sturdy. Thankfully, this eco-mommy had some recycled paper on hand and with my trusty paper cutter, I was ready to get creating! I cut the cardstock into rectangles (making sure they would fit into the envelopes I already had, duh) then got a bit fancier with some edging scissors to add some pizazz. Then...the best part. Choosing the tape! I picked a little of this, a tad of that and loved every second of it. I usually went with a piece at the top or bottom (wrapping on both the front and back) or left/right. Once my tape was set, I wrote my thoughtful note and prepared to seal a perfectly taped envelope with a kiss. Using the same tape as on my stationary, I added a splash of color on the envelope (after sealing of course) and honestly LOVED what I was seeing! Once I got going I just couldn't stop! I decided to whip up a bunch of different designs to keep on hand so I would be ready to share my new love with all the people I love.